Rob Zombie fans are well aware of the rock-legend’s projects outside of the music industry. However, his latest film role is a bit of a change of pace from his typical horror-themed ventures. 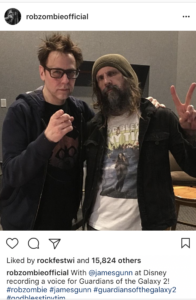 Zombie announced via his Instagram account that he’s lending his vocal talents for the Guardians of the Galaxy sequel. Fans can catch Zombie’s performance on the silver screen this May. They can see him perform live this Summer as he headlines Rock Fest in Cadott, Wi with Avenged Sevenfold and Slayer July 13-15. Tickets and more information on Rock Fest are available at www.rock-fest.com.